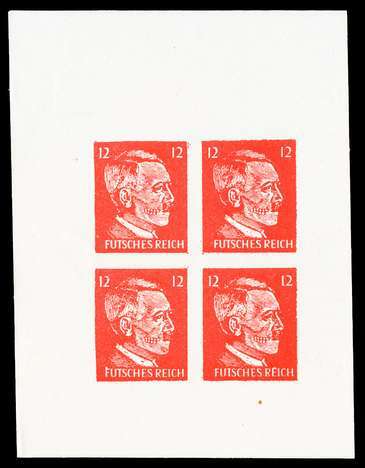 FORGERY OF A FORGERY: Forgery imperforate souvenir sheet of four of U.S. OSS "Operation Cornflakes" Postal Forgery of orange-red 12 pf Hitler Head stamp with the text "FUTSCHES REICH" (ruined empire) and the jaw partly exposed showing the teeth. The original postal forgeries were created ca.1942-1943 by the U.S. OSS (Office of Special Operations; precurssor to the CIA) in the design as shown on this item, but with perforations and printed in large sheets. The original postal forgery is listed in Michel as #17 of such postal forgeries -- it is costly and sought after. Text from the Henry Gitner hgitner.com website: "These stamps were key part of a high level clandestine plan to undermine the morale of the average German citizen. The Allies felt that if many German people started receiving Anti-Nazi propaganda in their morning mail delivered punctually at breakfast time by the mailman, they would feel that their "German Empire" was falling apart from within... The OSS decided that the best way to smuggle the mail into the regular German postal system was to bomb mail trains. In addition to bombs to possibly destroying the trains, they dropped sacks of mail containing Anti-Nazi propaganda. During the confusion of cleaning up the wreck, the false mail sacks were mixed with the damaged German mail. The OSS re-created all aspects of the German Postal system from real business return addresses to many thousands of names and addresses pulled from the telephone directories. They even replicated the mail bags, postal markings and every other detail of the postal system. 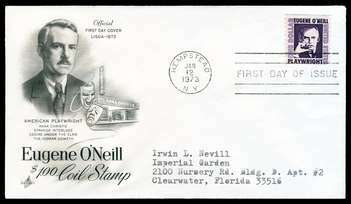 Every letter was franked with a 12pf stamp or two 6pf stamps. On opening the letter, they would find it filled with anti-Nazi propaganda including the 12pf "Futsches Reich" stamp." 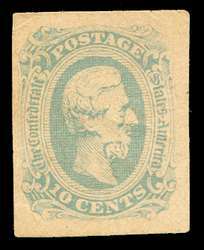 This, however, is a later -- I am guessing from the 1960s or perhaps the early 1970s; it is not a more recent reproduction which also may exist -- imperforate, gummed, souvenir sheet of four stamps reproduction / forgery of the original postal forgery. Over the years, I have seen dealers successfully selling this for around $20. 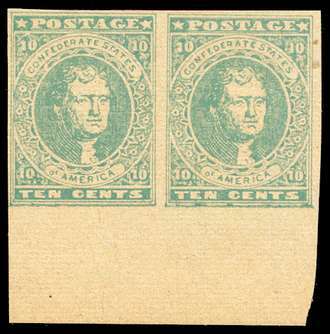 NH VF souvenir sheet of 4; small natural paper inclusion far out in the margin away from the stamps. CANNOT BE SHIPPED TO COUNTRIES WHERE SUCH ITEMS ARE PROHIBITED. 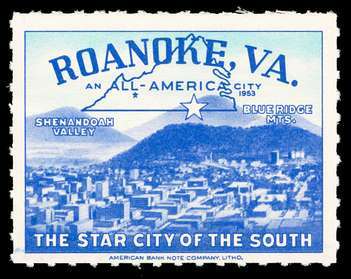 Label: "ROANOKE, VA. / AN ALL-AMERICA CITY / THE STAR CITY OF THE SOUTH". Lithographed, rouletted label design (view of the city with mountains in the distance) with printer inscription "AMERICAN BANK NOTE COMPANY, LITHO." Very attractive. The city was first named an All-America City in 1952 and six times subsequently. The huge star on a nearby mount was built in 1949 (it has an interesting history, see Wikipedia). This has the appearance of having been issued in the 1952-1965 time period. NH F-VF. 4-Block Available at 4x price. 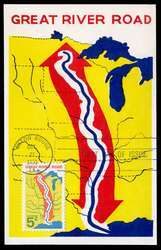 1319 [1966 5c Great River Road (Mississippi River)] Colorano #14. Baton Rouge, LA first day canceled maximum card. Mellone #9. Wonderful graphics. Seldom offered. 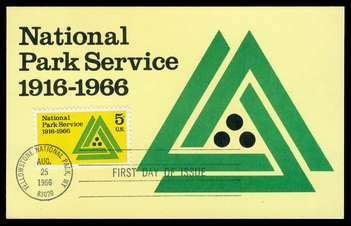 1314 [1966 5c National Park Service] Colorano #9. Yellowstone National Park, WY first day canceled maximum card. Mellone #?. Seldom offered. 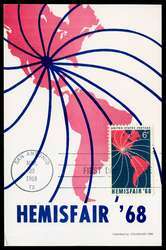 1340 [1968 6c Hemisfair 68] Colorano #?. San Antonio, TX first day canceled maximum card. Mellone #?. Seldom offered (the only offering I could find was at $16.99). 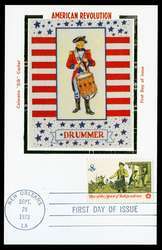 1479 [1973 8c American Revolution, Drummer, Rise of the Spirit of Independence] Colorano #? SILK. New Orleans, LA first day canceled maximum card. Mellone #?. Seldom offered (I was unable to find any offered). 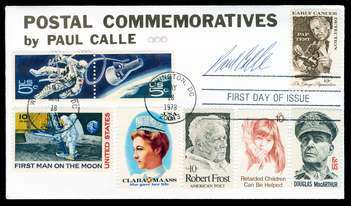 1294 [1967 $1.00 untagged, Eugene ONeill, Prominent American Series] Art Craft cacheted, neat typed address, Superb first day cover. 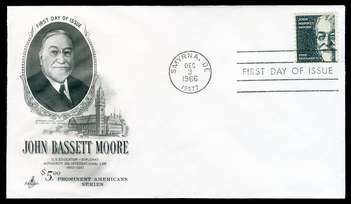 1295 [1966 $5.00 untagged, John Bassett Moore, Prominent American Series] Art Craft cacheted, UNaddressed, Superb first day cover. 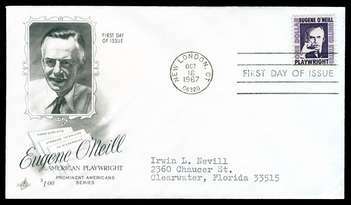 1305C [1973 $1.00 COIL, Eugene ONeill, Prominent American Series] Art Craft cacheted, neat typed address. Superb first day cover. 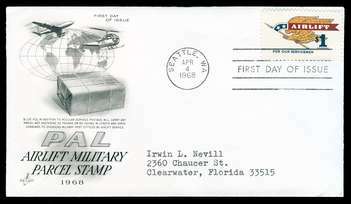 1341 [1968 $1.00 Airlift] Art Craft cacheted, neat typed address, Superb first day cover. 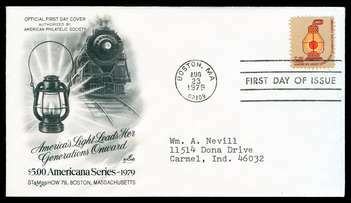 1612 [1979 $5.00 Railroad Lantern, Americana Series] Art Craft cacheted, neat typed address, Superb first day cover. 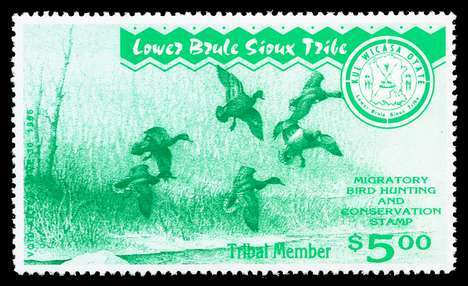 Lower Brule Sioux Tribe Duck and Conservation Stamp: 1995 (void after June 30, 1996) Tribal Member (green) $5.00. NH VF. Ducks taking flight. Lower Brule Sioux Tribe Duck and Conservation Stamps: 1996 (void after June 30, 1997) Complete set of 3 (Tribal/Resident $5, Non-Tribal South Dakota Resident $10, and Non-Resident Out-Of-State $10). NH VF. Bison and geese. Specialist dealers seem to sell this set for $39. 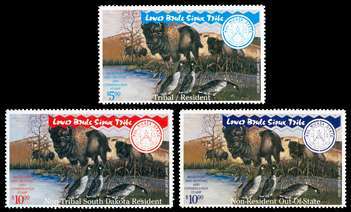 Lower Brule Sioux Tribe Duck and Conservation Stamps: 2000 (void after June 30, 2001) Group of 2 (Non-Tribal South Dakota Resident $10 and Non-Resident Out-Of-State $10). NH VF. Ducks taking flight. Specialist dealers seem to sell a set of 3 for $39. 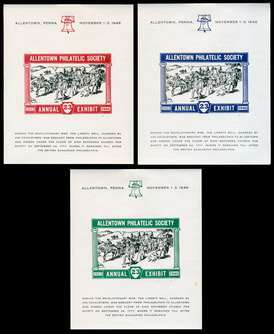 1946 Allentown Philatelic Society LIBERTY BELL U.S. Philatelic Exhibition Labels. 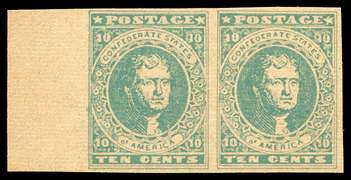 Set of three small imperforate souvenir sheets, Mint hinged VF, with black text/center and colored stamp frames in blue, green, and red. The text explains and the vignette pictures the 1777 force of 200 American calvary transporting the Liberty Bell from Philadelphia to Allentown for safekeeping under the floor of the Zion Reformed Church where it remained until the British evacuated Philadelphia. A scarce set of stamp show labels and a wonderful set for a thematic collection of Liberty Bell, American Revolution, American History, etc.